Preheat oven to 180°C. Sauté the chorizo in a pan until crispy, then add the wine and reduce for 5 minutes. Add the tinned tomato and dried herbs and simmer for 10 minutes. Stir in the garlic. And set aside. Season to taste. add the milk, whisking all the while until thickened. Stir in the cheese and season to taste. 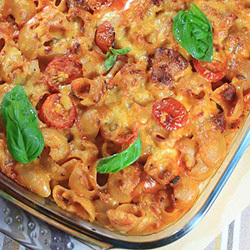 Mix the chorizo sauce, cheese sauce, drained pasta and cherry tomatoes in the biggest pot/pan. Season to taste. Spoon the mixture into a greased baking dish, top with cheese and bake for 20 minutes until golden and bubbling. Top with a few basil leaves before serving.